How do you get people talking about cheese? More specifically, how do you get people talking about Wisconsin Cheese? You could post a lame banner about how their Cheddar is better than your Cheddar. You could Tweet about how great Wisconsin Cheddar is. You could ask bloggers to talk about how great Wisconsin Cheddar is. Or, you could create a branded utility in the form of a microsite that is humorous, useful, interactive, helpful and interesting. And that's exactly what Shine Advertising of Madison, WI did by creating the Cheese and Burger Society. First, what is branded utility? An overarching concept focused on providing meaningful marketing that improves people's lives and adds value to the user. It's different: Sure, you could talk about cheese all day long. But why not talk about cheese from the angle of an American classic, The Cheeseburger? 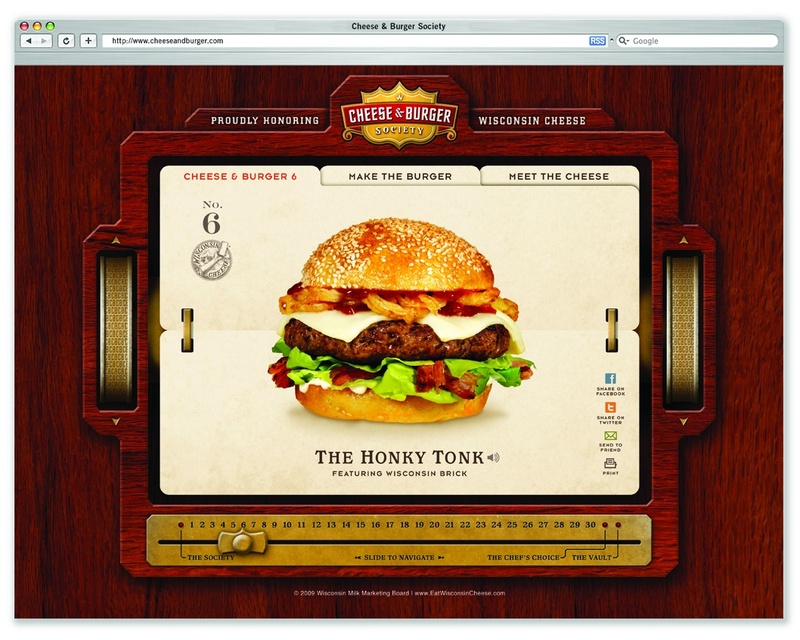 By highlighting the cheeseburger, cheese is part of the mix; but doesn't have to be the focal point. It's engaging: The design, the copy, and the entire vibe make you want to read more. It's got personality: The copy is cheeky, and the voice overdub of Patrick Warburton (aka Putty, or Joe Swanson) perfectly exemplifies what I would expect a cheeseburger's voice to sound like. And it's seriously funny ("Without Cheddar the world would be a sad, sad place for mouths"). It's useful: Each burger allows you to print the a pager including the burger recipe burger and suggested accompaniments. I learned about cheeses I didn't know existed, and I now have an idea for my next cookout. It works: The site funtionality does exactly what it's supposed to (the form could use some help). It's got brand focus: There is a sweepstakes involved, but the sweepstakes doesn't overtake the site. It's a secondary call to action, and if you do choose the sweepstakes from the splash page, you are quickly forwarded through all the burgers. By forwarding you through the entire collection, it suggests that the giveaway isn't as important as the content. It's a cohesive manifestation of brand self-awareness - it knows what makes it work and it sticks to it. It's got legs: People love cheeseburgers - just ask the 30,000 Facebook fans. You can upload photos, share recipes, and just talk about cheeseburgers because, damnit, you want to talk about cheeseburgers! It's attractive: The food photography is gorgeous, and I love the site design. Go check it out! Have a chuckle, get some recipes, and become the newest member of the Cheese and Burger Society.